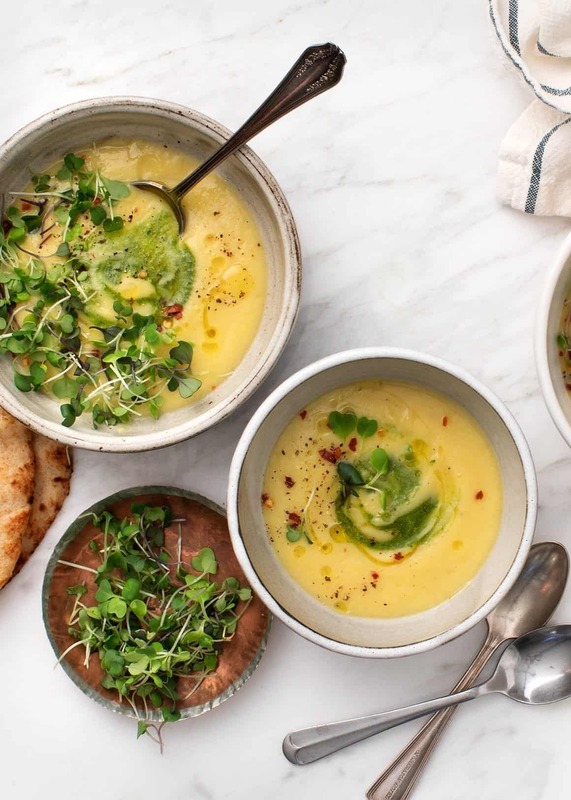 This curried cauliflower soup is made with just 9 ingredients and comes together in a few simple steps. It's destined for your regular meal rotation! Today is the last day of my 5-part meal plan, and it’s a good one! 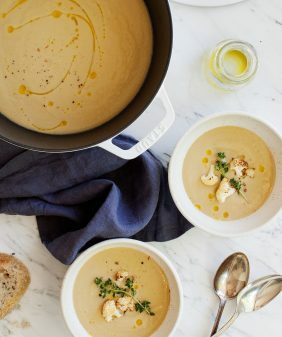 I love this curried cauliflower soup! It’s so darn simple to make and it’s so delicious with the curry spices. There’s a little kick from the cayenne and some brightness from the lemon. The ingredient list is short, so this is definitely a recipe that’s bound for the regular meal rotation… and it came about so unexpectedly. See, I started the this meal plan series last week with a set amount of groceries and ideas for 5 meals, each meal using the ingredients from the day before. For this fifth meal, I was going to make a big frittata that would use up any bits of random veggies I had left. A frittata is a great use-it-all-up kitchen sink sort of meal… and a natural last-day recipe strategy. That was a nice concept in theory, until I looked in the fridge and saw… not much. I used pretty much all of my remaining green veggies for Day 4’s pasta, but there in the back of the fridge was a big hunk of forgotten cauliflower… and the last bit of that yummy kale pepita pesto sauce. 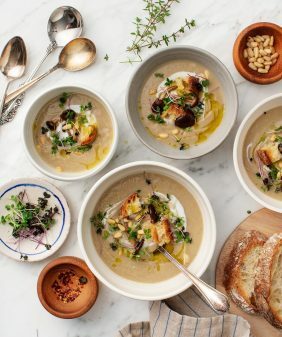 At first, I thought of making my go-to roasted cauliflower soup, but then I got really excited to change things up. Using the same steps I do in that soup (roasting and blending the cauliflower), I made this creamy curried cauliflower soup instead. Pictured above you’ll see this soup’s ingredients. Obviously, there aren’t many! Onion and garlic bring depth of flavor, lemon adds brightness, and cayenne gives a little heat to this creamy curried vegan soup. 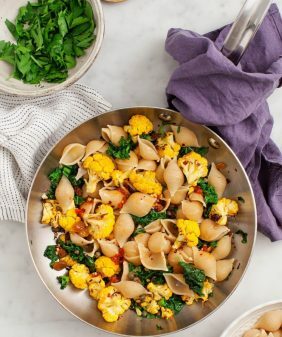 Once you top it with a swirl of kale pesto, you have a simple, comforting meal on the table that took almost no time at all! I just love the golden color of the curried cauliflower soup – it’s so light and yet so flavorful! Preheat the oven to 425°F. Wrap the onion wedges and the garlic clove in foil with a drizzle of olive oil and a pinch of salt and pepper. Roast until the onion is very soft and cooked through, 20 to 25 minutes. Remove from the oven, set aside (still wrapped in the foil), for 5 minutes so that the onion continues to steam and soften (If the onion is undercooked, the soup will be bitter). In a large pot of salted boiling water, cook the cauliflower florets and core pieces for 8 to 10 minutes, or until fork-tender. Scoop the cauliflower out of the water and into a blender. Add the roasted onion and (peeled) garlic, the vegetable broth, olive oil, lemon juice, curry powder, cayenne pepper, and a few generous pinches of salt and pepper. Blend until smooth. Taste and adjust seasonings, adding more salt and pepper, as desired. Add more lemon if you want the flavors to be brighter, more curry powder if you want a stronger curry flavor, and more cayenne if you want more of a kick! 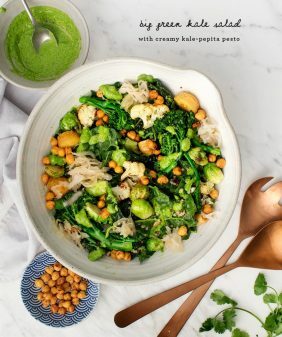 Scoop into bowls and serve with swirls of the Creamy Kale Pepita Pesto. * Top with the microgreens and red pepper flakes, if desired. Serve with naan bread. *Note: If your leftover pesto has thickened in the fridge, stir in a little olive oil to loosen it up. I just ordered the meal journal. i was totally inspired by the last few posts! <3 yum yum yum!! I have never tried one of your soup recipes and been disappointed. How many servings ish does this make? Hi Adian – thank you!! It serves 2 large servings, or 3-4 as a smaller side. This is easy and delicious! I had cauliflower rice in the freezer and it worked beautifully. Hey just wanted to say – LOVED the 5 day meal plan. Cooking for one, I’m all about finding creative ways to reuse the same ingredients for the week. Very practical and delicious – thank you! Hope you show us more of these! Mmmm, this soup is literally GOLDEN! loved your five day meal plan! I think this method of cooking and meal planning is very efficient and ensures less waste! I would love to see more in the future! Thank you for sharing! Love the colour, the pictures and the soup recipe, of course. 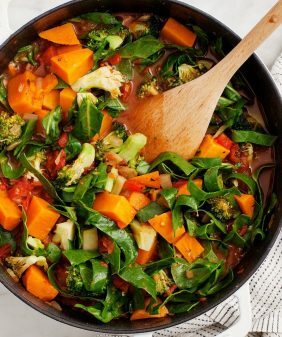 I’m working through this meal plan currently and I have to say – I LOVE it! Simple, quick, tasty, healthy recipes and no waste! Please do more of these meal plans! Hi Karen – I’m so glad you enjoyed it, thanks for letting me know you’d like more of them! 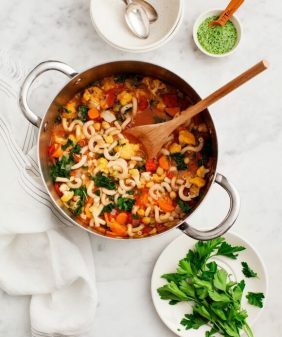 You are on fire with these curried soups! Don’t stop!